Crockpot Thai Chicken Noodle Soup ~ Learn, Live, and Explore! The crockpot is a lazy cook's best friend. It's baffling how easy it is to dump ingredients into it, then hours later you have an amazingly delicious meal. This soup is going to blow you away. You don't even have to like thai food to take delight in the flavors this soup presents. I am not a person who particularly enjoys spicy food, so the sweet and citrusy base is perfect with little embellishment. For those who like more kick, adding jalapeños and red bell peppers as additional garnishes works great. My friend passed along this Thai Chicken Noodle Soup recipe to me from the noblepig.com website and I made some slight modifications. 1. 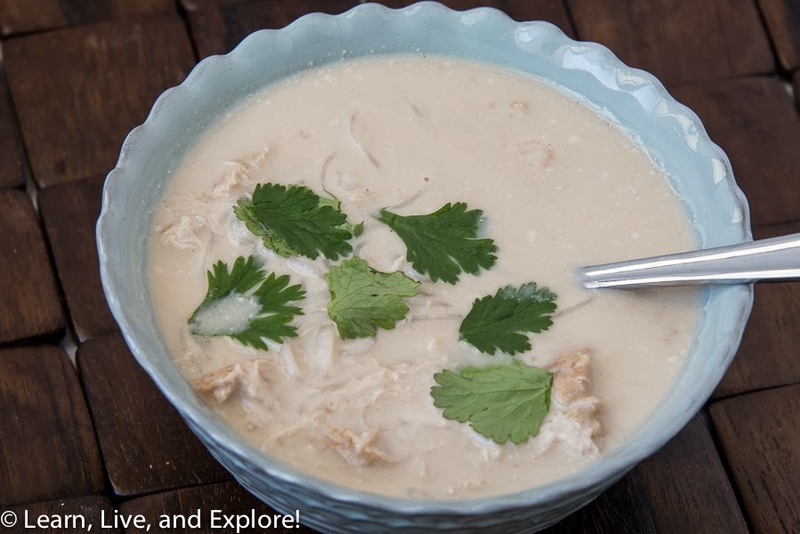 In your crockpot or slowcooker, combine the coconut milk, chicken stock, soy sauce, chicken, and a pinch of salt and pepper. 2. Cook on high for 3 hours. 3. Remove the chicken and shred with two forks on a large plate, then return the chicken to the pot. 4. Check seasoning and add salt and pepper if needed. 5. Bring a pot of water to boil on the stove, and cook the rice noodles per the directions provided (approximately 4-5 minutes). Drain and rinse with cold water. 6. In the microwave, place the bean sprouts in a microwave safe bowl and heat 30-45 seconds until tender but not too soft. 7. In the bottom of each serving bowl, place some bean sprouts and rice noodles in a generous pile. 8. Ladle some of the thai chicken soup into each bowl until full. 9. Garnish with cilantro leaves and fresh lime juice. Add bell peppers and jalapeños if desired.